Yahoo's Marc Spears reports that, right now, LeBron James is "doubtful" to play for Team USA in the 2016 Olympics, and that USA Basketball is unlikely to even ask him to play in international competition in 2014. This is a great way to get people to freak out right now, before LeBron reconsiders. "LeBron is going to be three years older during the next Olympics. He will have two older boys. He has a lot to endure with his family," the source told Y! Sports. "He played in three Olympics. Everyone that knows LeBron knows it's always based on a decision at that moment. But if the moment was today, the answer would be no." 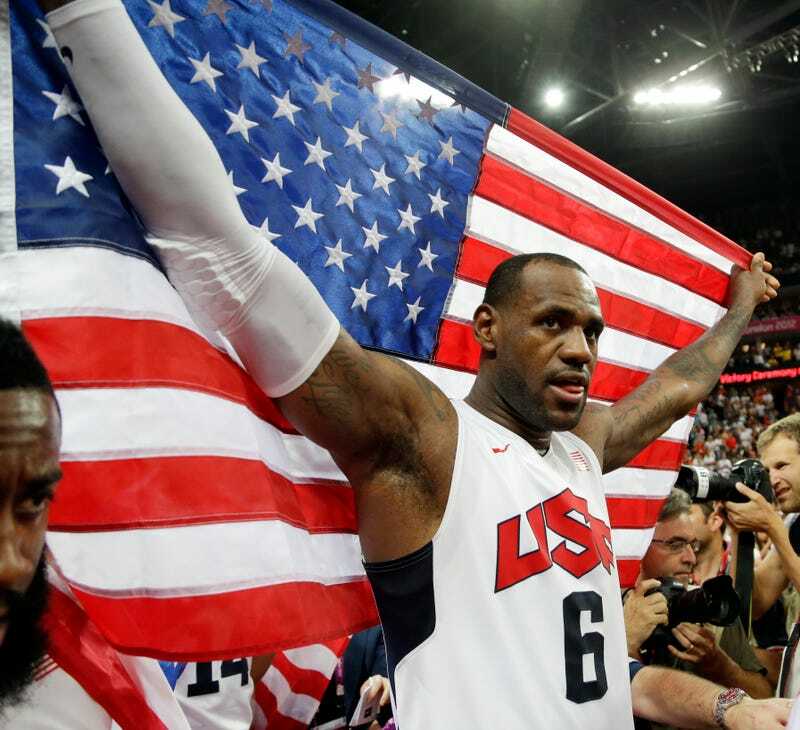 No one cares that LeBron isn't part of the U.S. team now, or won't be at the 2014 FIBA Basketball World Cup. The World Cup, which used to be the world championships, has never commanded American respect like the men's basketball portion of the Olympics in the post-Dream Team era. And LeBron not being around won't hurt Team USA, because the roster USA Basketball cobbled together for the 2010 worlds didn't include him, or most of the rest of the A-listers who went to London in 2012. Remember, USA Basketball in 2010 had to turn to Chauncey Billups and Lamar Odom for depth purposes, and it still thumped all but one foe by double digits. Kevin Durant, Derrick Rose, Stephen Curry, and Russell Westbrook were all on that team, and they're all better now—and they were all born in 1988, so they'll likely be around for a while. The only reason LeBron not playing for USA Basketball would even be A Thing is the presumption that he, as the best player in the world, ought to represent his country in the Olympics if he has the opportunity. It's a stupid presumption. LeBron has already given up three summers for the Olympics—more than Michael Jordan, who wasn't eligible to play in 1988 and didn't play in 1996, and Kobe Bryant, who wasn't part of the 2000 or 2004 teams. LeBron even gave up a summer after grinding through a dense, shortened season that produced his first title. Asking more of LeBron isn't new; his celestial talents demand the layman's stratospheric expectations. But no American basketball player has participated in the Olympics more than three times. In this context, LeBron is being asked to give more than anyone else has given before. His camp probably knows this, which would explain why it might see the PR value in planting doubt about his Team USA future now, while making it clear LeBron could still change his mind and choose to play in Rio after all. "I don't think he will ever be too old," Colangelo said. "He can be 40 and still be able to play. Think of what he might be able to accomplish in terms of legacy with one more medal. We'll cross that bridge later." That's good to know. Burying it at the bottom of a report about LeBron's Team USA future makes me think this report is much ado about nothing.